Hans Joachim Morgenthau (February17, 1904 -- July 19, 1980) was one of the leading twentieth-century figures in the study of international politics. He made landmark contributions to international relations theory and the study of international law, and his Politics Among Nations, first published in 1948, went through five editions during his lifetime. Morgenthau also wrote widely about international politics and US. foreign policy for general-circulation publications such as The New Leader, Commentary, Worldview, The New York Review of Books, and The New Republic. He knew and corresponded with many of the leading intellectuals and writers of his era, such as Reinhold Niebuhra, George F. Kennan, and Hannah Arendt. At one point in the early Cold War, Morgenthau was a consultant to the US. Departrnent of State when Kennan headed its Policy Planning Staff, and a second time during the Kennedy and Johnson administrations until he was dismissed when he began to publicly express his position of dissent concerning American involvement in Vietnam. For most of his career, however, Morgenthau was esteemed as an academic interpreter of U. S. foreign policy. 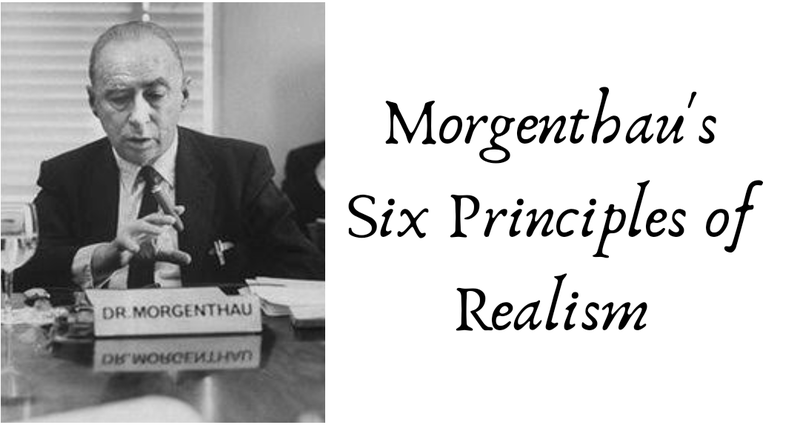 ● Starting with the second edition of Politics Among Nations, Morgenthau included a section in the opening chapter called " Six Principles of Political Realism". Political realism believes that objective laws that have their roots in human nature govern politics, like society in general. Human nature on which the laws of polities must be based has not changed since time immemorial. Hence it is first necessary to understand the laws by which society lives. Realism believes that the purpose of the laws of politics is to develop a rational theory that reflects these objective laws. Thus it believes in the objectivity and rationality of international politics supported by evidence and illuminated by reason rather than by subjective judgements. For realism, theory consists in ascertaining facts and giving them meaning though reason, and then testing this rational hypothesis against the actual facts. It assumes that the character of a foreign policy can be ascertained only through examination of the political act performed and the possible consequences of such acts. The foreign policy must also be examined from the possible rational alternatives. The main signpost of political realism in international relations is the concept of 'interest as defined in terms of power' This concept provides the link between reason trying to understand international politics and the fact to be made understood. It sets the politics as an autonomous sphere of action from other spheres such as economics (which is understood in terms of wealth or religion understood in terms of ethics.) Without such a concept, a theory of politics - international or domestic - would be altogether impossible because we cannot differentiate between political and non-political facts. ● The concept of power infuses rational order into international politics and make the theoretical understanding of politics possible. It makes the foreign policy of a particular nation intelligible and eliminates popular myths such as motives or ideological preferences. manner of its use are determined by the political and cultural environment. Political realism is aware of the moral significance of political action. It is also aware of the tension between the moral command and the requirements of successful political action. But realism maintains that the universal moral principles cannot be applied to the action of the states in their universal formulations, but they must be filtered through concrete circumstances of time and place. An individual can say ’let justice be done even if the world perishes’ but a state has no right to say so in the name of those who are under its care. The motto of the state is not morality. Realism considers prudence - the weighing of the consequences of alternative political action to be the supreme virtue to political. Political ethics considers all action by its political consequences. Political realism refuses to identify the moral aspirations of a particular nation with its moral laws that govern the universe. Realism distinguishes between truth and idolatry. All nations are tempted to clothe their own particular aspirations and actions in the moral purpose of the universe. On the other hand, for Realism, it is the concept of interest defined as power which is supreme. It claims that if we look at all nations as pursuing their national interest defined in terms of power, then we shall be able to do justice to all of them. In this way we are able to judge equally and are able to pursue politics that respects the interest of all other nations while protecting and promotin one’s own. Realism believes in the autonomy of the political sphere (just as economist, the lawyer or moralist maintain their own). The realist thinks interest defined in terms of power (as just economics thinks in terms of wealth or a lawyer in terms of legal rules). It does not mean that the political realist is unaware of the existence and relevance of standard of thought other than political but he cannot subordinate his political standard to other spheres. However, it does not mean disregard to other modes of thought. It implies that each should be assigned its proper sphere and function. Political realism is based upon pluralistic concept of human nature. Real man is a composition of economic, political, religious etc. but to understand one of them, one has to deal with it on its own terms. Every field should apply the standards appropriate to its thought. For politics, it is interest defined as power.